Last week, Bridgnorth Aluminium came into school to talk to Year 9 students about the importance of language skills and how they can benefit a wide range of careers. 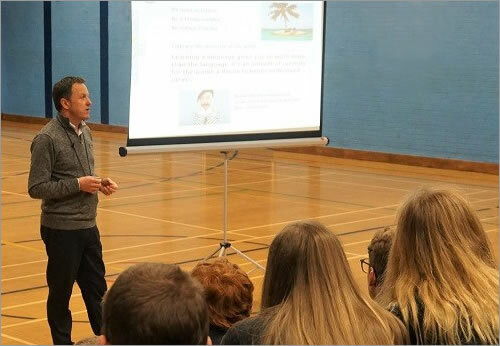 Adrian Musgrave, the company’s Sales and Marketing Manager, delivered the assembly and shared his own career path, highlighting the positive impact of learning a language. At the age of 16, Adrian took part in a school exchange to Germany, which sparked his interest in languages and galvanised him into taking A Levels in French and German. Keen to do a language at university, Adrian felt that taking it alongside another subject, such as science, engineering or business, was a powerful combination, so he opted for German with Management Studies. As part of his degree course, he undertook a placement year with a German company in Hamburg and, after graduating, he returned to Germany and worked in Dusseldorf for four years. Today, Adrian is a member of the senior leadership team at Bridgnorth Aluminium and heads up the company’s sales and marketing operations, dealing with customers around the globe. Adrian’s talk forms part of the extensive work that goes into preparing Year 9 students for making important decisions about their GCSE subject choices. Languages are a key focus in the school as all Year 10 and 11 pupils now follow the English Baccalaureate (EBacc) pathway, which includes science, maths and English, with the addition of a humanity and a language.